GREENBELT, Md. — With administration plans to cancel it announced earlier this year, and a lack of congressional support, NASA is in an "orderly closeout" phase of its Asteroid Redirect Mission (ARM) while keeping alive some of its key technologies for other applications. In a presentation at a June 13 meeting of the Small Bodies Assessment Group (SBAG) here, Michele Gates, program director for ARM at NASA Headquarters, said the mission received its "notice of defunding" from agency leadership in April, weeks after a budget blueprint document for fiscal year 2018 released by the White House called for cancelling the mission. "We are in an orderly closeout phase, capturing all the good work that has been done across the team, and transitioning activities as appropriate to other potential missions or archived for future use," she said. ARM called for sending a robotic spacecraft to a near Earth asteroid, where it would grab a boulder a few meters across from the asteroid's surface and return it to cislunar space. Astronauts flying on an Orion spacecraft would then visit the boulder, performing studies and collecting samples for return to Earth. The mission, though, struggled to win support since its introduction in 2013, particularly in Congress, where members were skeptical that the mission was on the critical path for NASA's long-term goal of sending humans to Mars in the 2030s. At recent hearings on NASA's 2018 budget request, members showed no interest in reversing plans in the proposal to cancel the mission. "It's good to see that the NASA budget request ends the previous administration's ill-conceived asteroid mission," said Rep. Lamar Smith (R-Texas), chairman of the House Science Committee, during a June 8 hearing by his committee's space subcommittee on the NASA budget request. "Instead, other, and more needed, technologies will be developed under different programs." As a result of the decision to close out ARM now, several ongoing efforts related to the mission are being cancelled, Gates said. They include proposals for hosted payloads that could fly on the robotic mission as well as membership in an "investigation team" for the mission. NASA will also not award a contract for the bus of the ARM robotic spacecraft for which it requested proposals last year. NASA has emphasized, though, that key technologies being developed for ARM will continue. The best-known of those is the solar-electric propulsion system that would have been flown on the robotic mission. Work on that technology will continue for use on other missions. NASA Acting Administrator Robert Lightfoot said at a June 8 hearing by the commerce, justice and science subcommittee of the House Appropriations Committee that a version of that solar-electric propulsion system could fly in the early 2020s as the "power propulsion module" of the agency's proposed Deep Space Gateway outpost in cislunar space. "It would build right off of the bus that we had for the Asteroid Redirect Mission," he said. The unit planned for that outpost, he said, likely would be smaller than the one envisioned for ARM, making it "more commercially viable for other uses." 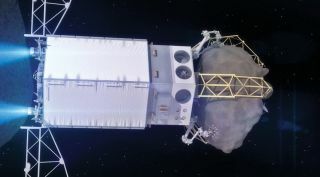 At the SBAG meeting, Gates said other elements of ARM would also be preserved, such as increased funding for near Earth asteroid searches and planetary defense techniques. "Many of the aspects that we were working towards in ARM will all be part of continued work in human exploration," she said. "The technologies that we were developing, the capabilities that we were developing in ARM, were not mission-specific," said Dan Mazanek, ARM mission investigator. "I haven't come up with anything that we were doing that was not applicable to a wide variety of missions." He expressed disappointment, though, that ARM will not continue. "This was kind of the best mission, or the dream mission, as far as I was concerned," he said, noting it combined science, human exploration, planetary defense and the use of in situ resources. "This mission was really the convergence of those different ideas, those different concepts." His hope, he said, is that "somehow, a form of ARM may arise in the future. I think still that it is a good mission."